Funnily enough, this was the only new place we dined out at, at the back end of our Barwon Heads getaway. We had returned to BeachHouse Barwon Heads, from a previous trip over, so no foodie review there, and then the following night we decided to stay in and do our own bbq while away – a very good idea. But upon returning home via the Queenscliff to Sorrento ferry, we had a little extra time on our hands, and decided to chill, hang around, and grab some lunch on what was a still and sunny February Summer’s day. Circa seemed like the perfect choice. Both a hotel and restaurant, the seating outside was ample and in a nice and bright position, the menu looked appealing, and then there was the greenery abounding which made us feel relaxed and like we were eating in someone’s friendly and quaint backyard. It was an order up at the counter type thing, so after perusing the menu and making selections, Hubbie went up to make our food and drink order, coming back with some necessary holiday-lunch BOOZE. Well for him anyway. I had an OJ. We were positioned with one of our favourite table numbers, so that was already reason enough for feel good vibes. There were other families about eating there, but it wasn’t packed, oddly enough, being a Saturday in Summer. Soon, after several trips to the loo with baby girl (she gets slightly obsessed with new outhouses when in new places) our meals arrived. We were all pleasantly surprised by our meals. Hubbie loved the Pulled Pork, I was in awe of how moorish and comforting my curry was, with the oh-so-necessary and amazing addition of rice and pappadums, and baby girl happily ate away at her clean piece of fish… and when a child is catered for as well as her parents, in terms of quality pieces of food… not only is she happy, but I am too. It was really very good. We weren’t expecting it to be horrible, but we knew being a hotel it might just be, you know, ‘casual’ lunch fare. Meanwhile the tastes were impressive and spectacular, and we immediately vowed we would we back on our next ferry ride over the Port Phillip Bay. Food: 7.5/10. Simple, but scoring high because it was what it was, and was amazing at that. Points for that. 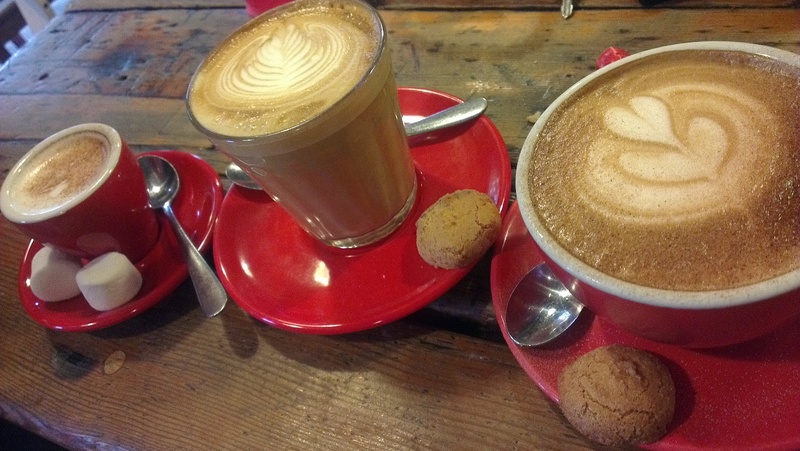 Coffee: N/A on this visit, we were only slightly spoilt by coffee choices back over in Barwon Heads 😉 But judging on their food, next visit, a must. Ambience: Very casual and relaxed out there in the front yard, with the sun shining down, local folk striding by amidst out-of-towners (ahem, US) and holiday vibes just abounding. Inside there is seating but I wasn’t privy to checking that out, though on a warmer day, I reckon head out, it rules. People: Locals and out-of-towners as already mentioned. Many groups. It’s a hotel, so a mix of all, though probably an older, family-friendly generation is the majority. Price: $ 76.00 Pretty decent wrap-up. 3 meals and a few drinks. And of course since it was so tasty, worth every cent. Advice: Sit outside on a warm day. If there is a curry on the menu and you don’t mind some heat, eat it, don’t be afraid. It is amazing. In a nutshell: A really lovely place to dine at that is unassuming but delivers on taste. If you want to sit outside, enjoy the local surroundings and watch the world go by, then this is definitely your place. And I mean, who wouldn’t want to enjoy some fine food and think about, I don’t know… how amazing life is? From the beginning, there were very high hopes for this restaurant. I had seen it listed high on the Urbanspoon Barwon Heads list. We had originally wanted to have dinner there on our 2nd night at Barwon Heads, which was a Monday, but upon calling them I discovered they weren’t open Mondays. So then, it was to be our last night there, a Tuesday night. I called after midday that Tuesday, and an initially-sounding poshy lady answered the phone. After requesting a table for 2 adults and a toddler, she asked me if we had been there before, explaining it was no BYO as they were fully licenced. She then asked how I had heard about them. I said intentionally, vaguely “oh, online. Some restaurant web site.” (Never mind Urbanspoon is a favourite on my toolbar). “Yeah, something like that.” Tee hee hee. I can’t reveal my blogger identity! what I’m after. When I want something, I enter stalker-FBI territory. We had already had a great, fantastic night at Beach House the previous night. I wasn’t expecting another night like that. Although the Café Maritana web site mentioned Italian-style tapa dishes that I was really excited about, I wasn’t expecting that the entire night and the atmosphere and the food and the staff and the EVERYTHING, would equal that. It wasn’t likely, and I didn’t want to get my hopes up only to then be let down. However, my hopes were up. Because it was our last night there, at Barwon Heads. In just less than a week we’d be back at work, our holidays over, and I’d be thinking of our next getaway. I was saying “I just want good food,” but I was lying. I wanted MORE. We arrived at 6:30pm. We were positioned right near the front door, near a window that overlooked the Barwon Heads Bridge over the Barwon River. I had the view, and it was great. The staff were immediately appealing and friendly, very much so to baby girl. Phew, it was a good start. Also, there was already a families in there as well as a group of older women. Even with just those, it seemed echoey. We were sooooo relieved. The woman who I’m guessing was the boss-lady, and quite possibly the one I spoke to on the phone, very quickly explained the menu concept to us. The menu was comprised of many share dishes, and diners were to tick with the pen supplied what dishes they wanted, and they would then slowly come out in a grazing fashion, the order at which they came out decided completely upon by the chef. I liked this. It was interesting, different, and would keep us guessing. I am not the biggest fan of chorizo, but I loved this with the cheese. 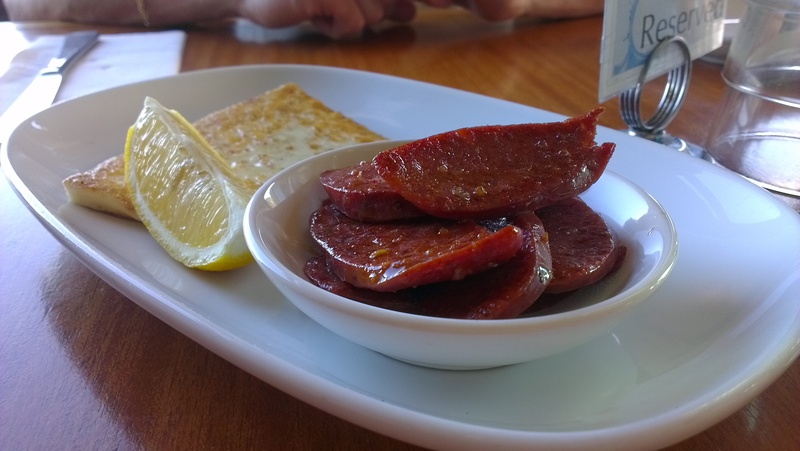 The saganaki was salty, and the chorizo was a nice meaty offset. With a squeeze of some lemon, this was made a very simple, yet divine dish. Warm, tasty, various complimenting flavours… I could have had more. We ate it up quickly. By name the garden salad sounded simple, but it was oh-so-yum. So yum and fresh. It’s made me think differently about salads to be honest, and now I want to reinvent the way I do salads because of that salad! Salads don’t have to be boring! This one had yellow, green and red tomatoes, fresh lettuce and feta cheese that wasn’t overpowering, and I say this not because I don’t like cheese (I LOVE CHEESE) but because I was surprised it didn’t have a stronger feta taste. As it was it totally blended in to the other ingredients. These were the majority of baby girl’s meal! They were great, but as chips go kind of what I would have expected, nothing out of the ordinary or special to be honest. 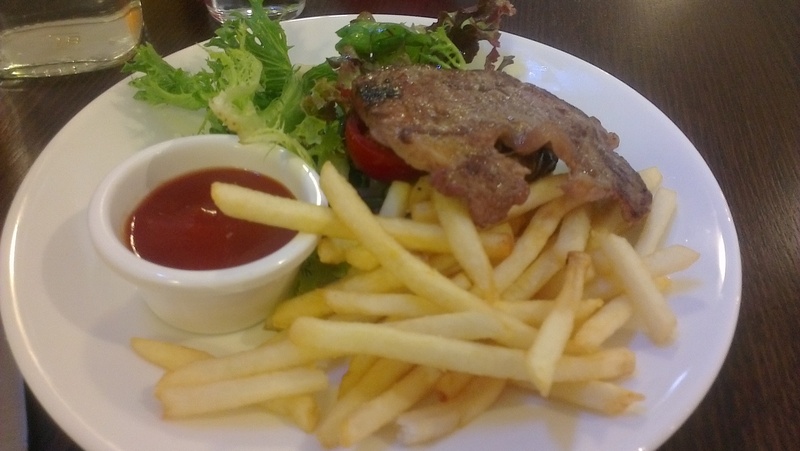 They came with aioli on the side, and I did notice the darker than usual chip colour, at first wondering if the oil they used was as fresh as it should be, and even Hubbie thought the same. 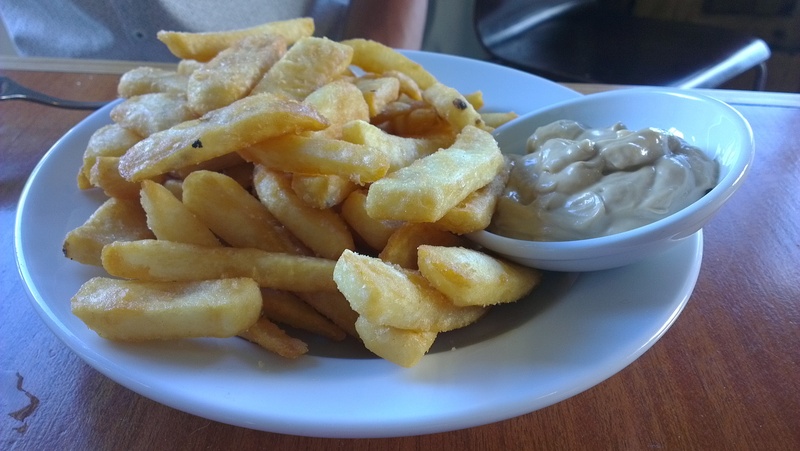 But we both realised that perhaps it was the batter that made it look darker, and I had reason to question and compare, as the fries we’d gotten at Beach House the previous night had been golden and crisp. It was cooked perfectly, pink and moist in the middle, however the marinade on the outside had made it char slightly whilst grilling. Still lovely, but I had preferred the one I’d had the night before. This was Hubbie’s primary dish though, so I didn’t mind. My dish came last: the garlic prawns in broth. Yum. The prawns were beautifully warm, hot even, kept so in the broth, and there were some hard pieces of bread on the side. With the carb overload on the beer battered chips, my initial response was to leave most of the bread, as by this stage I was starting to fill up. However all that garlic-y prawn-y liquid looked too good to waste, so I decided to do what was clearly suggested to me by the meal and dip some bread into the broth. 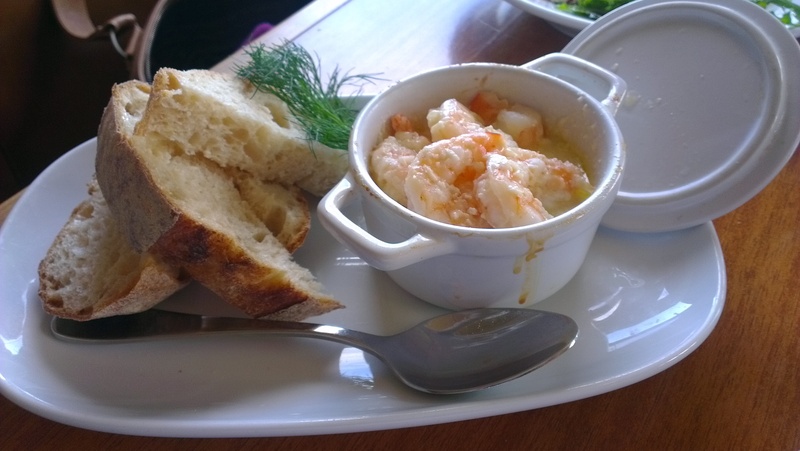 The flavour of the prawns kept well in the hard bread made soggy, and surprisingly I had most of the bread this way! It made it very edible. This prawn dish was just superb. I think the order of arrival was spot on. It wasn’t in order in terms of where they had been on the menu, but in terms of what you should graze on first, it was perfect. We were on a bit of a roll. Our dishes had been great, and the ambience and staff were matching too. The restaurant had steadily filled up post 7pm, and there were more families in there as well as couples. Generally, more of an older crowd were in at this time, and happily, at least one person from each party smiled at baby girl as they walked by us near the entrance. It was hard to ignore her there, what with her waving at them on arrival and reaching out and trying to grab people! They were all so lovely though. The volume of people made the noise in there even more so, so we were blending in really nicely. Our waitress was really very friendly, and so sweet to baby girl. She acknowledged her all the time, even doing a little peek-a-boo with her as she stood in the kitchen where baby girl had spotted her. She was genuinely sweet and friendly, and this makes a difference too, as you can spot pretension and fake-friendliness a mile away. She was a breath of fresh air. Unlike Annie’s, this place just had a happy, more jovial mood, and as Hubbie observed, even one of the crankiest looking diners sitting nearby, an older man, smiled when baby girl started her usual squeals of delight. I wondered: was it the place, the vibe that was different? Was it the fact that people are more relaxed at the end of the day and more allowing of noise emanating from young children, more so than at the start of the day when they need a little longer to get used to short outbursts? Did dinner at Maritana win out over brekkie at Annie’s solely due to the time of day? That may have had a little to do with it, if I’m going to allow that tiny out for Annie’s. But it wasn’t the only thing that made it different. Without a doubt, the feel at Café Maritana was far more welcoming, and I guess I’ll know for sure next time we’re in town and we head over for breakfast to confirm. Coffee was already poured over it. (If you don’t understand my horror, click here for an explanation). I tried to keep in mind that everything else had been great, trying to still the disappointment that was brewing inside. I waited for Hubbie to return and we exchanged a bit of a look. However, he didn’t seem too fussed as he tasted it, informing that it was spectacular. I had to agree. Even the presentation, though very simple, was done in a rather rustic look, much like the French old-school style that was evident throughout the restaurant, with little French mementos and Parisian city-landscape decals planted on the windows, and the big barrel that sat near the front entrance making you feel like you’d just sat down at a winery on that side of the world. But still…. I really would have liked to taste the coffee on its own first. 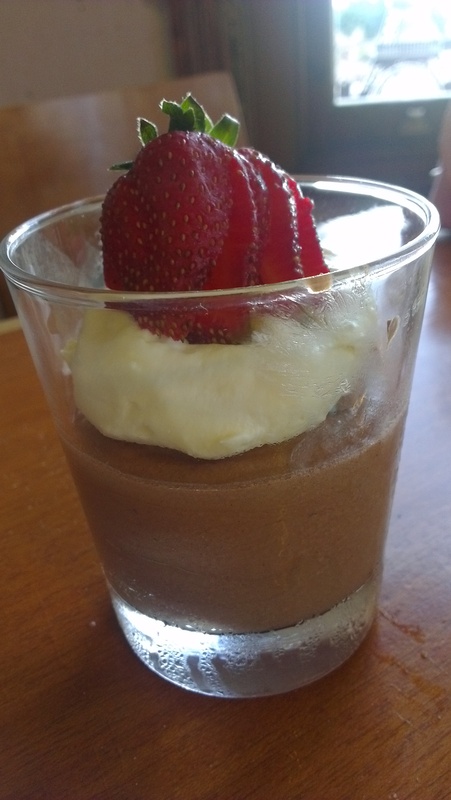 The choc mousse was nice, and at one point I found it a bit much on top of all those share meals in my tummy, but then I think I got used to it and I even found it quite light to eat. I ate almost all of it before hitting a food-wall, which is when I got Hubbie to help me out. The nice touch that took the restaurant from evening to night was the string of fairy lights that turned on above us, scattered across the ceiling in a romantic fashion, and surprisingly a movie was also projected onto the wall near me, an older movie that I didn’t catch, but I saw Audrey Hepburn and could immediately understand the old-school feel they were trying to emulate with it. I found it interesting how they did appear to go from family-friendly to romantic and still keep everyone happy throughout the night. Food: 9/10. Taste and presentation, as well as the premise, were on the money. Coffee: 7.5/10. It tasted good, I just needed to try it on its own! Ambience: Fantastic, perfect for us. It was busy, family-friendly, yet was still able to retain some sense of intimacy and romanticism as the night wore on… maybe due to the fairy lights, the movie on the wall, or Audrey?! It had a lively happy vibe. Staff: Great, exceptional. From our waitress to boss-lady, even to the chef who smiled over at baby girl’s shrieks, they were all AWESOME. Price: Actually, pretty decent considering what you’re getting. Our bill came to $136, slightly less than what we’d paid at Beach House the previous night. And that total included 5 share meals, 4 drinks and 2 desserts. Not bad. 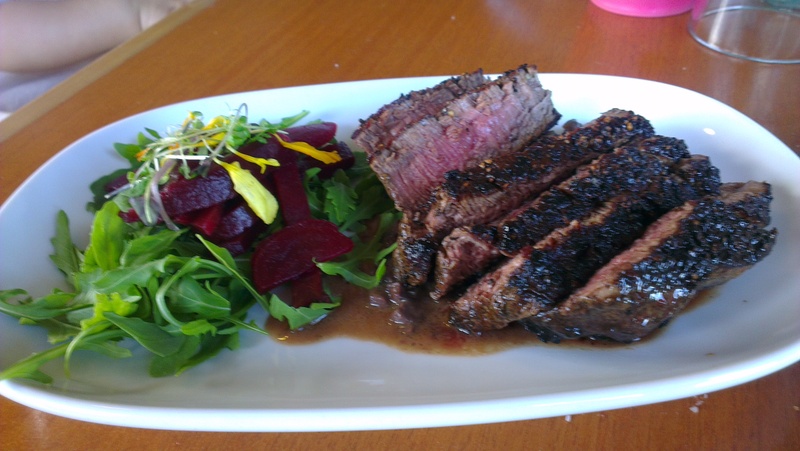 The most expensive meal on our bill was the eye fillet, and at $26, for what you’re getting, even with the ‘share’ serve, it was a steal. This place isn’t expensive at all, maybe mid-range I’d say. Definite value for money here. Advice: Book ahead. I think everyone generally likes that. You can sit inside, or in the two outdoor areas on the sides of the restaurant. Go on a lovely day, so you can work off your scrumptious meal with a short stroll across the road at the park, or the beach. In a nutshell: Italian-style tapas is something that excited me, and I’ll keep thinking of them for a long time after, until we get a chance to go back and sample some more amazing share meals. We’ll definitely breakfast here next time we’re in town. The price and staff and ambience and amazing location are all the bonuses that make this the best place to dine at in Barwon Heads. Hands down. At first, I didn’t want to go into this restaurant. I was dressed up, perhaps a bit too much for the beach locals, and felt that I would stand up insurmountably against everyone else there. People looked casual sipping their drinks and watching people walk by at the front of the premises Parisian style, and I was actually, inwardly groaning as we walked up into the restaurant. There was not much up our food-alley on offer on our second night there at Barwon Heads. We had parked ourselves once again along Hitchcock Avenue: we had already dined at Barwon Orange, and wanted to try something different; Annie’s was closed that night, and the one I had tried to book before discovering they weren’t open on Monday’s was Café Maritana. That we would discover the following night. At the Rocks had too many recent bad reviews on Urbanspoon for me to want to risk throwing our holiday dollars away there, and everything else in close proximity was either closed, or too cas. We weren’t going to have fish and chips. We wanted to sit in nice surroundings, and eat and relax for a couple of hours. Hubbie convinced me in. I ignored the looks and walked behind him, trying to hide behind baby girl. I love dressing up, but I hate staring. I can’t stand it. So what if I’m dressed up? You don’t have to ogle. I was immediately relieved and impressed when I saw the interior. This, was much fancier. In fact, by looking at the exterior, I never would have guessed the interior would have looked like this. The tables and chairs were a dressier version of the outside, with a large bar in the middle of the room and ample space to be seated. Even so, we were greeted by a serious lady who asked if we had booked. Was this a thing in Barwon Heads? As someone said on Urbanspoon, this isn’t Melbourne. This place certainly had the space to fit us, and nearby empty tables didn’t seem to have a reserved sign. In fact, as we had learned the previous night at Barwon Orange, even in that smaller space they had been able to sit us. Fortunately, she seated us, and so become one unexpectedly great night. Inside it was swish, but the beachy vibe was still there with huge leaf-like fans across the ceiling. Even the people dining in there were more stylish, wanting to make a meal out of the night, as it were. We ordered drinks and baby girl’s meal first, and I informed our lovely young waitress if they could bring out her meal ASAP – they didn’t have to deliver it with ours. It came surprisingly quick, right after our drinks came, and conveniently right on time as she was starting to fuss. 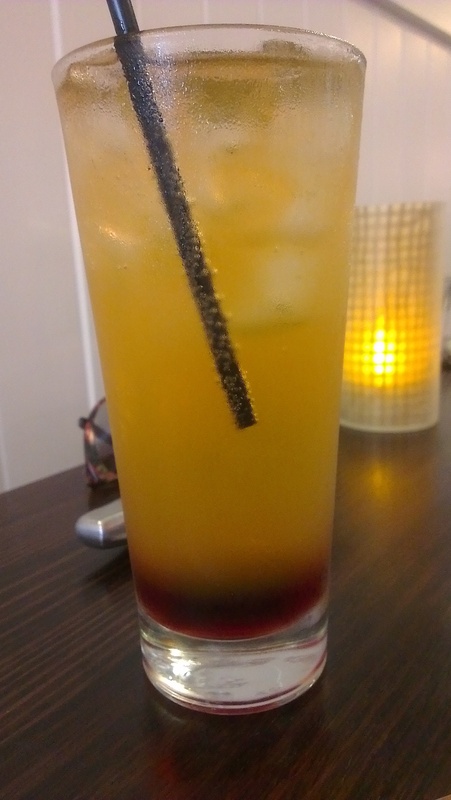 I’d ordered an Almost Heaven cocktail, and the name pretty much summed it up for how the night was to become. It wasn’t overwhelmingly beautiful-looking, served just in a tall glass, but it was fresh and summery, and suited the night to a T.
The eye fillet was a very big and thick piece, and for my request of medium-to-well cooked with no blood, looking at it as it arrived on our table I wasn’t feeling confident it had been fulfilled. Even cutting into it and seeing the red ooze out, I went “oh no.” But then I realised that the red was just the juices, not in fact the blood, and the inside was very acceptably cooked: in fact, my butcher Hubbie very assertively said that given the size and request, it was cooked to perfection. Farrrrr. He said perfect? And after I tasted it, I couldn’t agree more. Well you’d hope so for $41. It had a great flavour, and although the porcini and red wine butter was very distinctive in taste, I actually loved it, and was remembering the taste days after the meal. I had crisp fries and salad on the side, and happily ate it all. 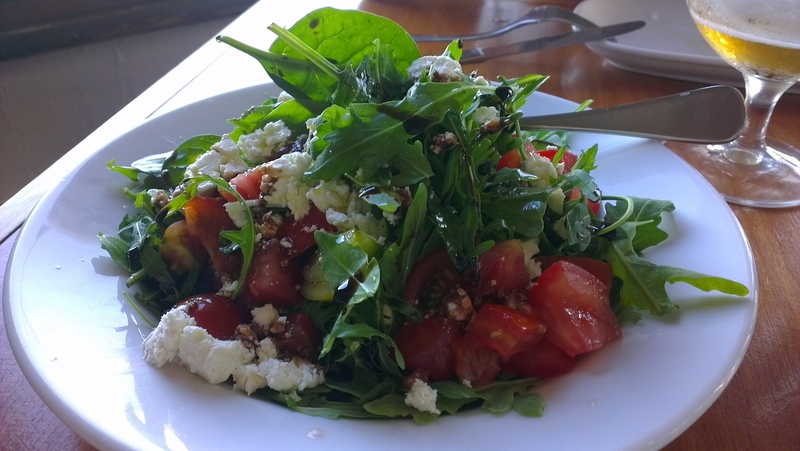 The salad was like the salad we’d tasted on baby girl’s plate, crisp and so-fresh tasting. It’s so hard to get a fresh salad nowadays. And the tomatoes, actually TASTED like a tomato, straight from the garden. 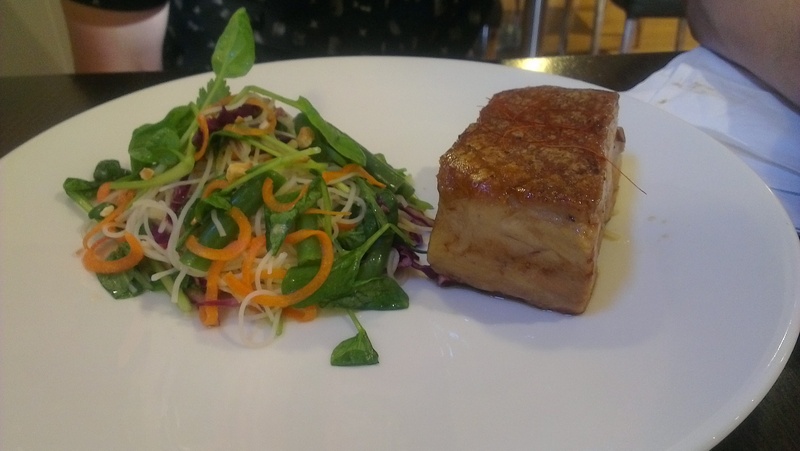 Hubbie’s meal of pork belly was baked confit-style, and so he wasn’t used to eating it a different colour than the usual grilled-style colour he gets. However it was soft and flavoursome, and he thoroughly enjoyed the Asian style salad on the side which had sweet and spicy characteristics. The combination was good, different yet still enjoyable. Considering we had both ordered different meals to our usual choices, at a first-time restaurant for us, and been happy with the results, I thought of as a very good outcome. It’s hard to win at that, but we did. All the food was soon gone, even baby girl’s with our assistance. While baby girl got scoops of vanilla ice cream. At only $3 a serve, why the hell not? I had requested bailey’s on the side while Hubbie had asked for cointreau. 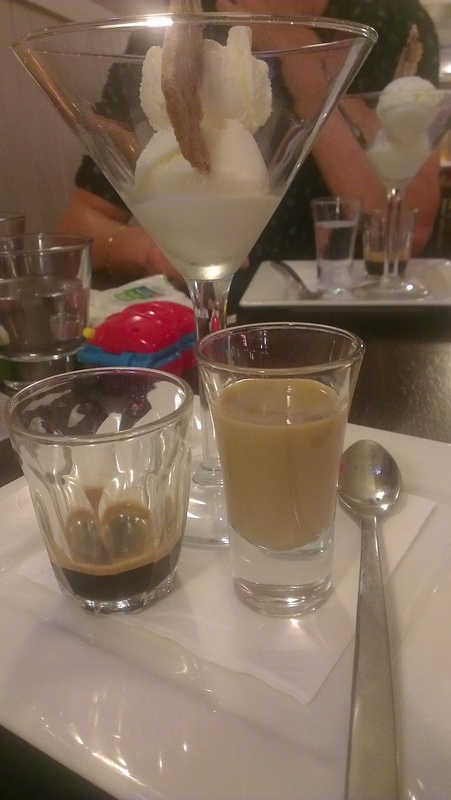 The presentation of the ice cream with coffee on the side, a shot of liqueur to the other side, and a biscuit in the ice cream, was PERFECT. It looked divine, and it TASTED divine. I loved the biscuit. LOVED LOVED LOVED it. Tell me where you buy it and I’m buying it in bulk. Beautiful accompaniment to the coffee, a great crunchy and nutty texture. YUM. The only fault with this dish, that kept it from being a 10/10, was the quantity of coffee. The quality was excellent, but there was just that little bit too little coffee in the cup. But if that’s the only fault, you know they’re doing well. Everything went superbly that night. Along with our amazing food, our waitresses, in particular our main one was very, very nice and friendly, including to baby girl, and it was on that night we were starting to realise just how much of a difference that makes to her. When she shrieks, she does it out of joy, or for attention, and with the waitresses actually responding and smiling at her, as the other very friendly nearby diners were, she was absolutely rapt. She was a happier baby, which made our time there much, much happier. Some people may not care much for ratings on ambience and the nature of the staff and the people who frequent the restaurants we go to, but trust me, with children in tow, these things are vital. Because if your child is happy with you, your experience will be all the more enjoyable. Especially with children, friendliness matters. The waitresses here seemed nicer than those at Barwon Orange (and s!&t all over the ones at Annie’s – sorry to be so frank), and maybe that was solely because they had actually smiled and spoken to her. I don’t need waiters to pick up my girl and twirl her around. I just want them to acknowledge her with a smile, when she smiles and waves at them. I want her growing up knowing that there are good people in this world. I don’t think that’s too much to ask for. The friendliness of those around us, along with the more spacious nature of the restaurant, meant that even when baby girl shrieked with glee at all the attention she was getting, it was drowned out, meaning no chefs were looking over from their kitchens this night. LOL. Family-friendly, tick. Food: 8.5/10. Simple food, done well. I like how the colour of our fries was golden, meaning fresh oil. 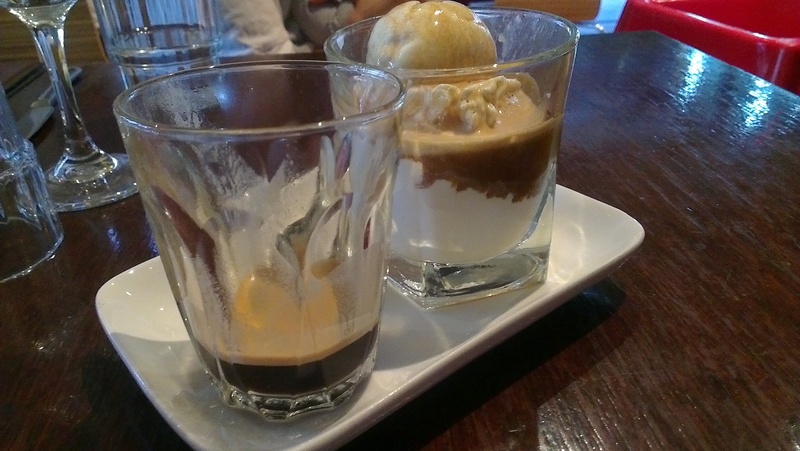 That affogato… OMG. Almost 10/10 on its own. Coffee: 8.5/10. Would like to try their cappuccinos one day, if their short blacks are anything to go by. Ambience: Fantastic for families. Big and loud, but still that bit special and fancy. People: Fancier inside, but really lovely. Two large groups of people were seated near us throughout the night, and both times they were all so nice, and unexpectedly giving baby girl loads of attention. I mean LOADS. This was baby girl’s night, she was loving it. This kept her distracted, occupied and busy, which made things easier for us, and a distinguishable key in the success of the night. Price: Well, we ordered 3 meals, 3 desserts, and 3 drinks. Some large, some small. For a total of under the mid $100s, which was expected. On key, I think, price-wise. Advice: Book in advance. I think this is a Barwon Heads thing. Or a holiday-period thing. Or a Summer thing. Either way, just book, anywhere in Barwon Heads. And that’s it. Nothing else. Loved it. In a nutshell: Simple food, served well and fresh and wholesome, in a great bustling environment that’s still fancy enough for those wanting something finer – just dine inside if you want fancy. We were really happy with our night, our meals, and how happily everyone there responded to our baby girl. A lot of great memories were made on that particular night in Barwon Heads, at Beach House Barwon Heads, which means we’ll look back on it fondly. We will definitely go back on our next visit in town, and I will end on this note: Thank God I didn’t let the exterior form my final opinion on dining there. We were lucky to just stroll into Barwon Orange and get some seating on our first night at Barwon Heads. Even though it was a Sunday night, during summer and holiday season, we snuck in at about 6:30pm right before the onslaught of diners embarked within the next half hour. We were surprised at just how many ‘reserved’ signs were scattered throughout the tables of the restaurant, and it made us appreciate our good timing that night. The waitress was very friendly and seated us happily despite our lack of a reservation. After we ordered I had a good look around the place. We had been seated inside right by the counter and coffee-making machine, however the fold-out doors were open making us feel like we were outside, as we had a great view of the outdoor diners and even the people passing by on the street. Along with the ocean pictures and sun horizons adorning the walls, their open doors gave it a great beachy vibe, though at the same time black shades enclosed fancy chandeliers hanging above us, and urban furniture inside the restaurant gave it yet another feel. There was a combining of themes happening here, and yet it all worked and gave the atmosphere an interesting and welcoming feel. I think the welcoming and homely feel was also attributed to the number of people coming in and ordering/picking-up pizzas to-go. I think I could safely say a decent majority, if not all of them were locals, or regular holiday locals. This made the atmosphere more relaxed, with the amount of delivery boxes heading out the doors that we saw that night. With a glass of 2013 Montevecchio Moscato. The moscato was light and fresh, with definite fruit notes. A great compliment at the end of a warm summer’s day. My dish was the classic seafood dish you’d come to expect at restaurants that are positioned seaside. 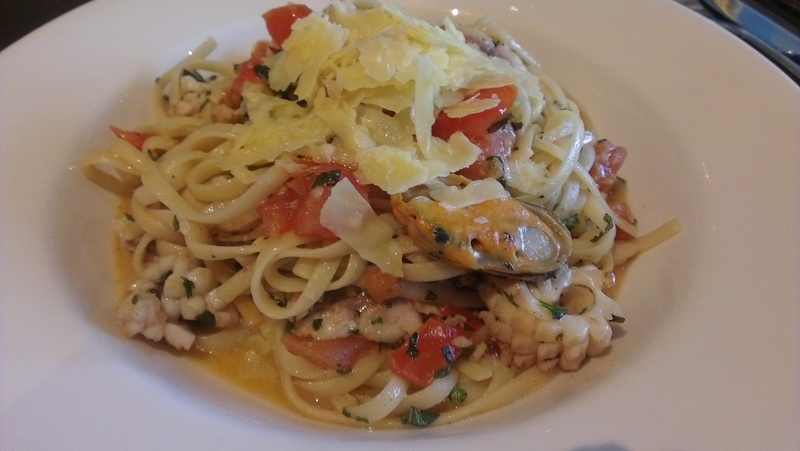 There was a definite and clear seafood flavour in the dish with pieces of tomato throughout, and I was happy to see there was plenty of seafood alongside the pasta. I enjoyed the bits of fish, prawns and mussels I found in there, however I didn’t quite enjoy the calamari, and that’s just because I’m pretty fussy and don’t enjoy it much at all. You may say that I’m not a proper seafood enthusiast – whatever. This was a tad chewy, and I don’t think it’s meant to be so. I don’t expect much from calamari as it is, so I didn’t mind so much. I left a little behind on my plate, only because we’d had a late lunch, followed by coffee and cake at Annie’s, so I was feeling REALLY full. I would have had it all if I could, I just wanted to leave a little room for dessert too. 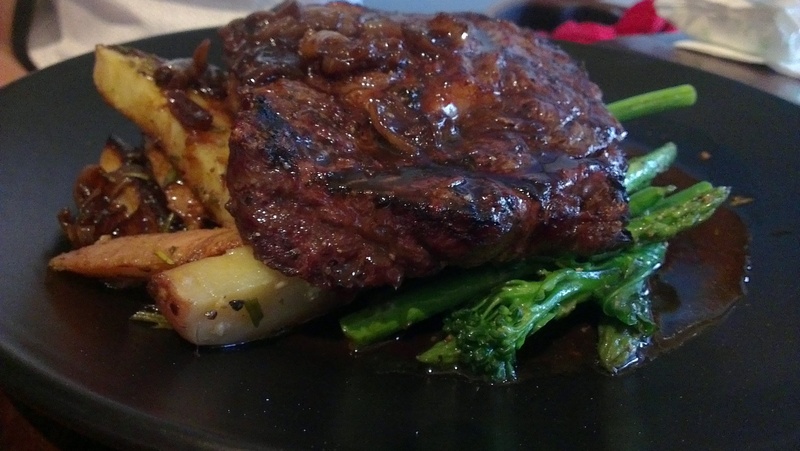 Hubbie enjoyed his scotch fillet. It was a real hearty, simple meal that catered to his palate. 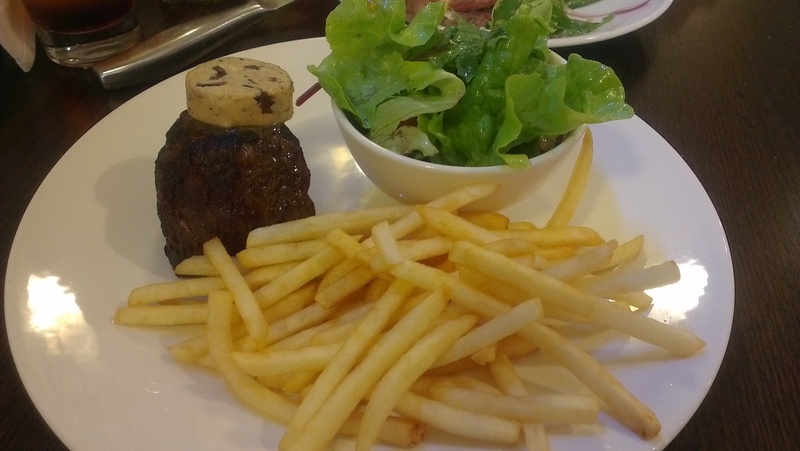 The piece of scotch fillet was huge, so the slice was thin, and Hubbie said had the piece been smaller and the slice thicker, it would have retained more of the juices, especially with his medium request. (You butcher, you 😉 ) Still, he enjoyed the meal, despite like me, still being full from the earlier meals of the day. Placing the damn coffee on the side so you can pour the quantity yourself over the ice cream. Very, very simple. And yet some places totally f$%k this up. Happily, Barwon Orange complied. We both tasted the coffee first to see just how strong it was, to discover, yep, it was freaking strong. So we quickly poured it over the ice cream, and ahhh. Much better. 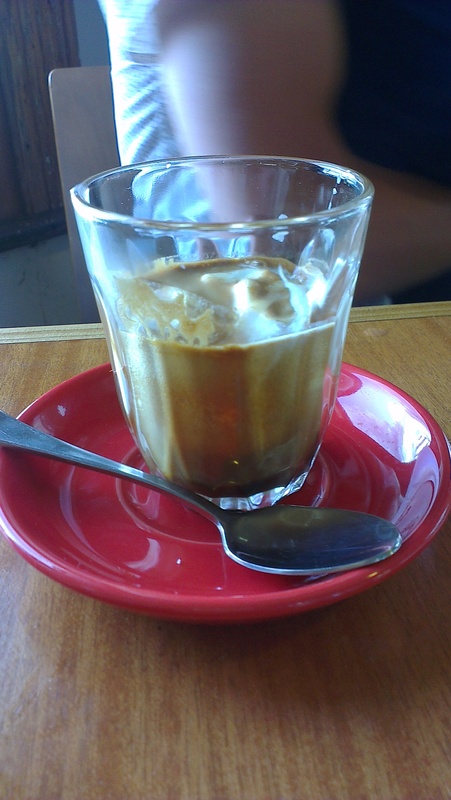 Combining ice cream and coffee is truly a magical, wondrous mix. They also had placed a straw on the side. When the coffee and what was left of the ice cream melted together into a caramel-gold liquid, we sucked it up and… wow. What a coffee hit. It was so much stronger through the straw than eating it from a spoon. Maybe because the coffee remains from the bottom of the cup hit us right on the palate in concentrated form? Interesting. Coffee: 7/10. This score, the coffee on its own. Staff: Very friendly and very smiley. Didn’t grimace when we walked up without a reservation despite how busy they got (and knew they were gonna get with all those ‘reserved’ signs). People: Fancy-schmancy families, and locals who are just going about their business. Price: On the upside, but totally acceptable for this type of restaurant with the style, food and presentation on offer. waitress if the bill came to the table or if I should go up to the counter. She said I could do either, so I decided to just pack up our things and walk up. When I pointed our table out to the girl behind the counter, she tallied up our two mains, two drinks and affogato to $132. I was surprised but I didn’t think quick enough to remember all we had ordered, and so paid, not wanting to cause a scene, all the while trying to remember and second-guessing the number of drinks we’d had, feeling like something was amiss. I told Hubbie and when he too confirmed that that didn’t sound right, I immediately went back and asked for our bill to be checked. Turns out the previous bill hadn’t been cleared, and the amount of $47 had been added onto our bill. $47 extra! Imagine if I’d gone without checking. That’s about the amount we paid for lunch that day. The girl was very sorry and I know these things can happen, so I don’t hold it against her, however like I said, bills to the table from now on! 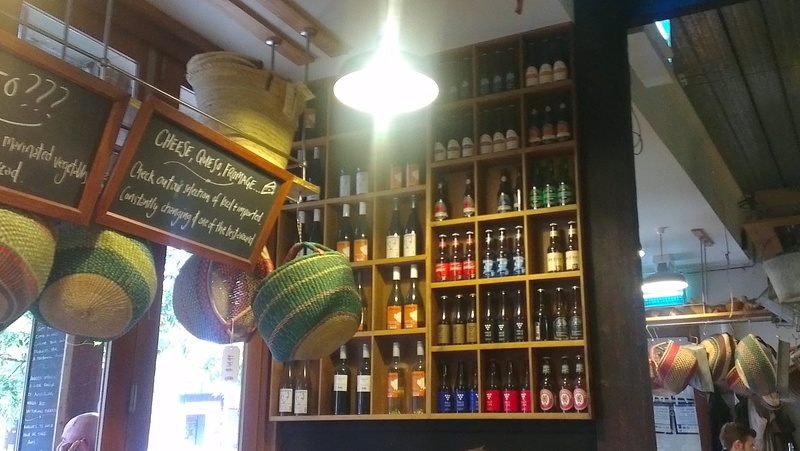 In a nutshell: Great presentation of food, a great vibe and interesting surroundings, as well as a good variety of meals on offer to suit many palates makes this a great place to eat. The staff were friendly and very welcoming. I would definitely go back, this time with toys for baby girl so that we don’t upset the people holidaying. Annie are you ok, are you ok…. are you ok if I bring my kid? Annie’s was our first coffee stop during our Barwon Heads getaway on that brilliantly sunny first day. We were along the coastline, on the other side of the city, that part of town that Hubbie’s work mates affectionately refer to as ‘Little Essendon’ due to the number of their customers that holiday there. Their exterior displayed eclectic beach/bush-funk, and a peek into the interior showed what looked like an exclusive little deli and bakery amidst indoor seating. I overheard one woman saying to her friend as they peeked inside “Oh, I wish we had seen this place first before having our chips!” I would have been spewing too. There were quite a few tables adorning the sidewalk, all with umbrellas, expect for the one free table we made a beeline for. Despite the cool wind we had bright sunlight in our eyes, which made our initial visit there short and sweet, just like the subsequent coffee and cake that we had. We sat Parisian style, all of us facing the sidewalk watching the people and dogs (which baby girl loved) walk by. We ordered coffees, a babycino for baby girl and a lemon and lime tart, as the vanilla slice hubbie had requested was unfortunately sold out. 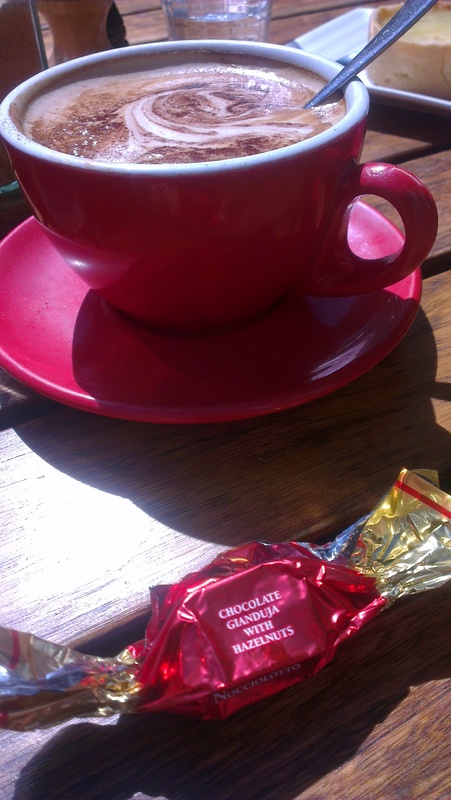 Both our latte and cappuccinos came with a choccie on the side, which I found a nice touch. They were decent sized coffees, another plus, however for me I found the flavour a tad too strong. Hubbie loved his though. As did baby girl. 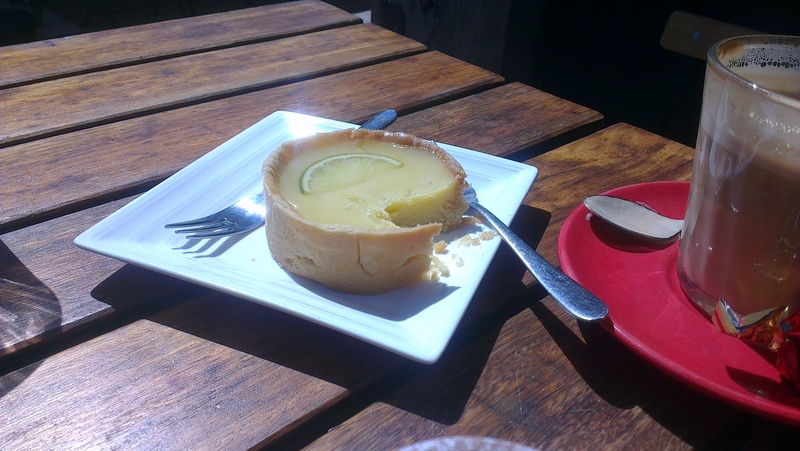 The tart was nice and tangy, with a hint of creaminess. Nice and fresh, and a lovely accompaniment to the strong coffee. On our second day in town, I stopped in to buy some much needed deli brie. I had decided after discovering the deli, that there was no way I was getting it conveniently from the local IGA. Nothing against the supermarket, but when I see gourmet deli, I’m like a little kid in a candy shop. And so true to the cliché, I was, as I walked in to feast my eyes upon the offerings on that very hot second day. I was perusing the choccies, bikkies, cheeses and hams, and all the deliciously gourmet local/imported deli offerings available to be bought for good dough. Speaking of, they even had many varieties of loaf bread, both basic and gourmet styles. 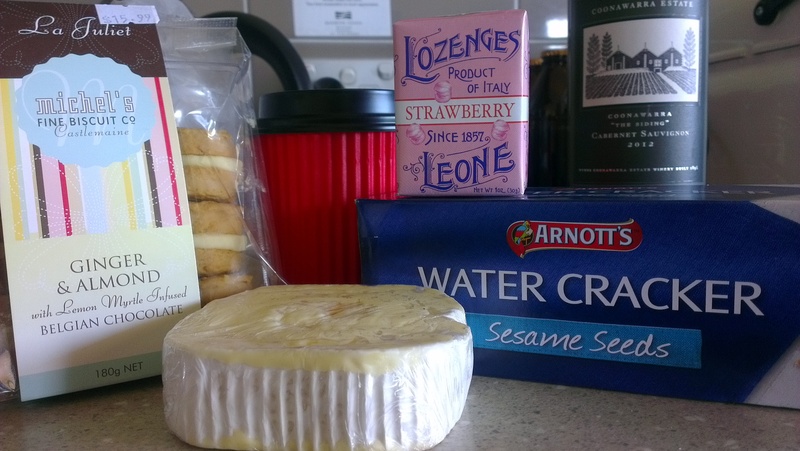 After having a good sticky-beak, I settled on a triple cream brie, some spanakopita to take back and share with Hubbie, some strawberry lollies, and some ginger and almond biscuits with lemon myrtle infused Belgian chocolate, to have with our takeaway coffees. That place seriously, is a deli lover’s dream. I happily bought, paid, and then went to stand by the bread to wait for my coffees. And wait. And wait. And…. wait. If I had known how long the wait would be, I would have gone there first, ordered, driven my car to the IGA to buy the groceries I had already bought that day, and come back to Annie’s to pick up the coffees which I reckon would have just become ready. Geez. It took forever. It probably felt longer as I was just standing there doing nothing but ‘taking in,’ but it really was a long while. When I finally did get my coffees after what seemed like a forever of 15-20 minutes, I realised they had earned some brownie points: with the inclusion of two little pieces of brownie beside our coffees on the tray. “The cappuccino is the one with the brownie on top,” said the young blond kid to me as he handed me the coffees. I said thanks, but at first I was a bit peeved as I already had a bag to carry, another hand for the coffee tray, and then one of my taken hands also had to hold in place my dress with the massive slit going down the front, in fear the breeze outside blew the wrong way. And now I had to balance brownies, ON a coffee tray. Just to make things interesting. However as the human-multitasker, I even surprised myself with how well I manoeuvred to the car and back to our room with EVERYTHING intact. Score. And, I had realised why the coffees had taken so long to arrive when I stepped outside. It was now absolutely packed, with what seemed like everyone trying to score an outdoor seat and enjoy some coffee and sweets in the sunshine. Again, the coffee was strong that day, but I think I was starting to get used to it. The biscuits had great texture, and the filling was decadent and creamy. Finally, the spanakopita was just what we needed as we had pretty much forgotten lunch in our busy-ness that day. Later that day we tried the lollies, and they indeed were strawberry sweet, and the brie was well…. Mmmmmmm. Worth the wait and drive and everything. Perfect with crackers and a glass of cab sav. On our third day there we went for breakfast. I had been very gung-ho about having to have brekkie there, since that first day when I’d noticed on the menu that they had coconut pancakes. Oh my. I just had to, it was a must. 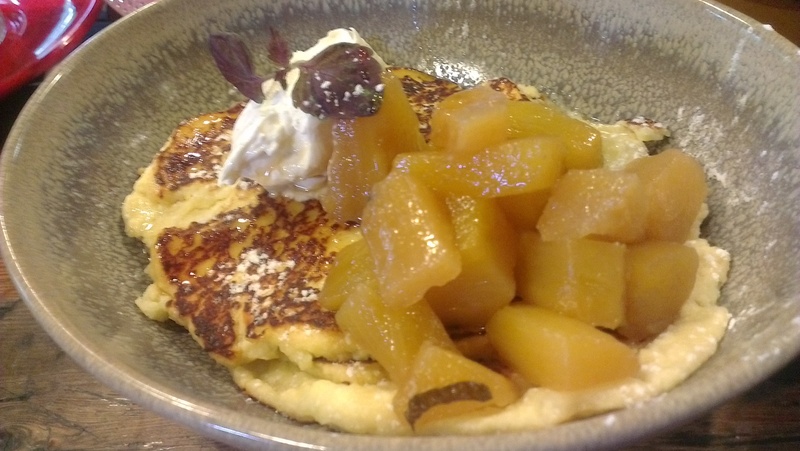 I’m a savoury brekkie girl, but the thought of coconut pancakes? I just had to see what it was all about. Unlike our first two days, this day was almost pouring. There was consistent rain coming in from early morning, and we ran in with an umbrella trying to cover the three of us. No one was outside, bar two girls who bravely sat under an umbrella at a wet table. This time, the interior was fairly full, but this isn’t hard to achieve as you wouldn’t call their indoor area amply-spaced. We stood, looking around, thinking someone was going to seat us, and then I realised that we had to sit ourselves down. After all, when you pay and order you need to go to the counter, and only after that do you get your order delivered to your table. I realised that was the odd contradiction to this place. It was homely, earthy, eclectic, and interesting. 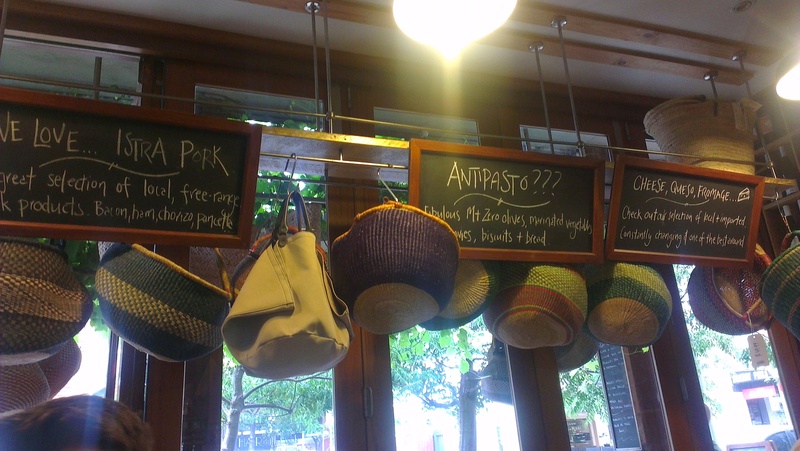 It seemed au naturel, with its back yard feel of baskets hanging from the ceiling, wooden chairs that were all different colours and sizes, and bakery and deli goods just hanging around waiting to be grabbed by outstretched hands. But there was a definite poshy undertone, and I don’t know if it was the staff, the clientele, or a bit of both that made the air so. Either way, it was a definite mix. We sat at a communal table and after asking a waitress clearing plates nearby, she brought over a highchair for baby girl. During our time there we had some difficulty keeping her entertained and shriek-free, having to endure some looks from other diners. In particular was the fine group of three pole-bums at the other end of our table who couldn’t even smile at baby girl as she grinned happily in their direction. I don’t expect people to make conversation and goo-goo ga-ga with her, but I’ve discovered one very important and factual life rule since having her: people, even rude people and mean people, will still smile and get all soft when a baby smiles AT THEM. People change in the presence of such innocence, and so I have to wonder what type of woman would ignore a child and turn away, feigning ignorance, when such a beautiful girl smiles AND WAVES, in her direction. I’m bias, because she’s mine. But like I said, what kind of heart would do this? Someone with the absence of one perhaps? Anyway, back to the brekkie. We got our coffees surprisingly quick, quick compared to how long I’d had to wait the previous day. This time with cookies! Great job guys, loving the sweet extras. My pancakes were nice, but not what I had expected. They were warm and beautiful, but a bit doughy. The cream atop them was nice and fresh, and I had most of the pineapple, but together I had expected more. It was lovely, but maybe my expectations of what coconut pancakes would be like were too high, especially with the build-up over a few days. I’m not sure. Then again, I think it was just a case of me being a savoury-brekkie girl. The sweet temptation had tempted me into going the sweet route, and once again I was thinking ‘I should have gotten my usual eggs.’ Next time. 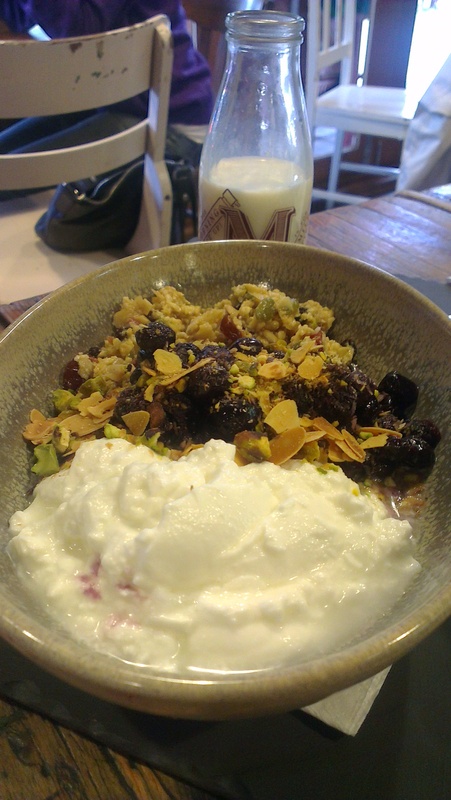 Hubbie wasn’t a fan of his bircher muesli, but then towards the end he didn’t mind it. I should probably explain that here’s a man who’s recently decided to go fairly carb-free, right before going away and then has tried to eat lighter meals while we go out. He never eats bircher muesli, and then he’s ordered it in an attempt to avoid his usual ‘big brekky’ style meal. I tried his meal, and agreed that it was very sweet with a definite all-spice taste, which is probably where the sour yoghurt comes in, to offset it. If I were him I would’ve preferred eggs too. As it was, I was. Coffee: 7/10. My score would have been lower if the serves weren’t so big, as the coffee wasn’t to taste for me, although I did grow accustomed to it after each visit. Points for free sweets on the side too. Ambience: Relaxed surroundings, with a poshy, sometimes stuck-up vibe. As we were coming to realise, this was almost like another Noosa, but here unfortunately, we experienced more snootiness. It didn’t contain the commercial aspect that getaway spots like Noosa does, so in that it was good in retaining its local vibe. And despite the nose-up factor, it actually seemed very family and dog-friendly. Staff: Friendly, but not enough smiles. I did also notice that they are quite pedantic about placing coffees in front of the correct person when they deliver them to the tables, something we experienced and what I also witnessed both times we ate in. I like that kind of attention-to-detail, but it does make me wonder which idiot didn’t know what coffee they were drinking and caused such a fuss due to their own lack of common sense to make the waiters so fussy now. People: Family-types, with-money-don’t-care-attitudes, though they care enough to want to look at you and see who you are. A good smattering of older customers too. Price: Medium to the up-side. 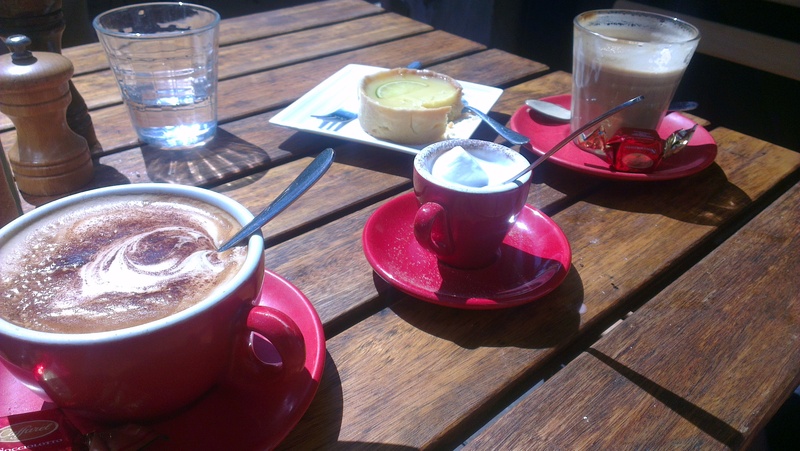 For example our first visit of coffees and cake only came to $15-ish for the lot, which I thought was not too bad for some afternoon treats. My deli and coffee order the following day was a bit higher, and I think that was due to the $55.00 a kilo brie and $16 packet of cookies. That I was kinda expecting, buying from the gourmet deli and all. And then on day 3 we paid about $41, for 3 drinks and 2 meals. That was a tad much, also because we didn’t walk away totally satisfied. If our brekkies had been worth it, I wouldn’t have minded how much they charged on our 3rd visit. Advice: Get some umbrella shade on a hot day if you can. If you go with kids, don’t expect to feel overly comfortable. When you order, remember what number was on the table you sat at, unless you like being descriptive. 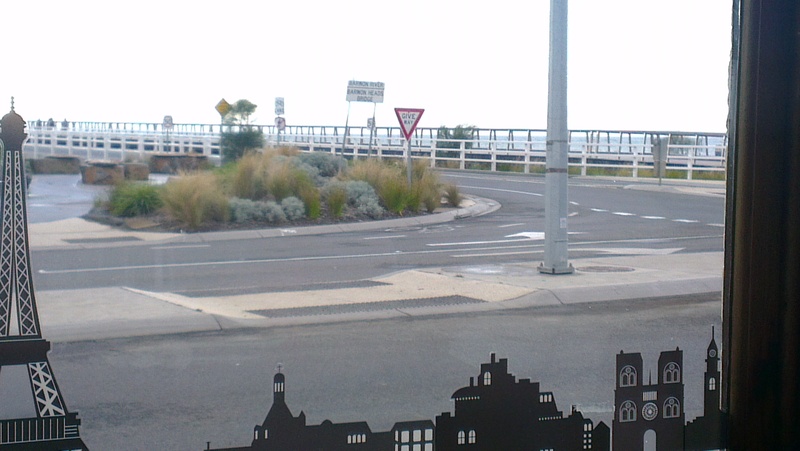 In a nutshell: A really lovely place to have a sit-down and enjoy the relaxed lifestyle that Barwon Heads has to offer. This is one of the prettiest places on Hitchcock Avenue that you can dine at, so definitely do it. The food could be better, however the provedore did live up to my expectations. I would not recommend this as a child-friendly place, solely based on my experience of the people that dine there. I would come back and try the savoury dishes next time we’re in town, but only if I had a tonne of toys to keep baby girl occupied and shriek-free.